Opening this weekend in theatres across the country: Channing Tatum and Jamie Bell star in the epic adventure, The Eagle; Adam Sandler tries to woo a younger woman in the comedy, Just Go With It; William Shakespeare’s classic tragedy gets a comic take in the animated Gnomeo And Juliet; plus a look at the music documentary, Justin Bieber: Never Say Never. Sword and sandal epics are a dime a dozen, and so are films that try to set themselves in some far-off land and fail miserably to capture any of that far-off land appeal. Director Kevin Macdonald’s The Eagle is not a dime-a-dozen adventure film though, and it might be the first epic I’ve seen in a few years that felt like it was made with blood, sweat, and tears, rather than computer generated fodder. 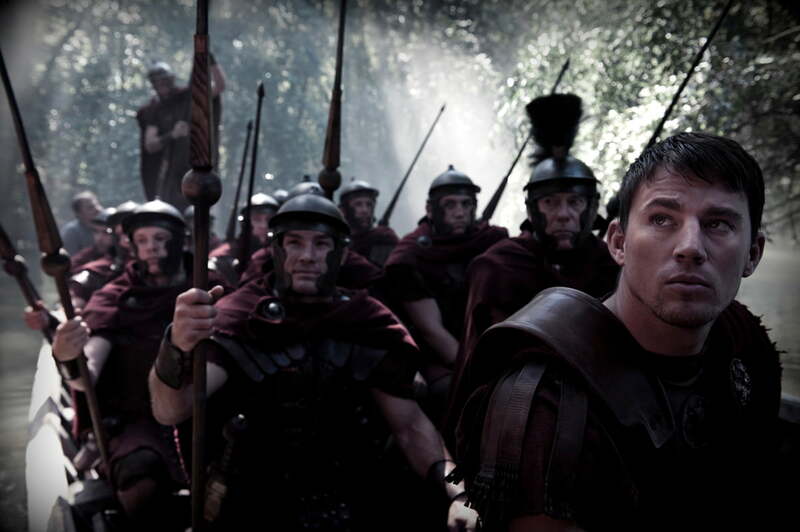 Channing Tatum stars as Marcus Aquila, a young Roman soldier in 140 AD who is sent to the far North, near the edge of Hadrian’s Wall, to defend an outpost that keeps the recently defeated Britains at bay. For Marcus, the position is important because the area is where his father Flavius was last seen twenty years ago before he marched Rome’s 5,000-strong Ninth Legion into the wilderness, never to return, taking with him the proud symbol of Rome: a golden eagle. Marcus doesn’t have a lot of time to soak in the scenery though when his outpost is attacked just a short time into his command and he is gravely injured saving some of his men. Carted off to heal with his uncle, played by Donald Sutherland, Marcus is honourably discharged from the army and left to his own devices, where he begins chewing over the problem of his family’s honour, which was sullied by the loss of the Eagle of the Ninth. A chance encounter with a brave slave named Esca, who is played by Jamie Bell, changes Marcus’ life though, and sees the duo heading north, across Hadrian’s wall to search for the lost eagle and restore the Aquila family name. Along that path, Marcus will have to hide in the shadow of his slave, or risk getting both of them killed by the tribes of Caledonia, known today as Scotland. Although Macdonald’s film is unlikely to win any awards for acting, The Last King of Scotland director earns charming performances from Tatum and Bell, who easily carry this film as something of a buddy epic. Both men are strong leads, with a chemistry that speaks of the characters’ shared honour, pride, and friendship. Their performances, and the performances of all of the warriors of the north, lends utter credence to the feeling that we’re following these people through 140 AD Britain. I’ve very rarely felt so immersed in another time, another place, and another culture, but The Eagle handles all of these elements perfectly. The dialogue by Jeremy Brock, which takes a decidedly modern slant, was unfortunately a little hard to take, as are some of the last moments in the film, but these are forgivable failings next to the film’s overall story and mood. Perhaps a stronger film would have raised more questions about Marcus’ honour, or the futility of war, but Macdonald is to be commended for creating a film that is uniquely driven. The cinematography by Academy Award-winner Anthony Dod Mantle, known for his incredible work on films like Slumdog Millionaire, 28 Days Later, and recently for 127 Hours, is also notable, as is the music by Atli Örvarsson, production design by Michael Carlin, not to even mention the art direction and costumes. Had the film’s final 15 minutes been a little less silly, and not quite so terribly cheesy, The Eagle might be a lot more interesting to discuss, but in the end I’m recommending The Eagle because it succeeded up until that point. I’ll forgive the error in the ending only because the film is anything but standard. It’s not in the league of Gladiator, but it’s certainly closer than you might expect. There are probably only two reasons you might want to see Just Go With It: either you’re a guy, and the ads featuring Brooklyn Decker had you convinced the moment she appeared in a bikini, or you’re a fan of Adam Sandler and you’ll watch his films no matter what. Either way, it’s hard to imagine any circumstance where you’re going to leave the cinema happily after seeing director Dennis Dugan’s Just Go With It. Sandler stars as Danny, a plastic surgeon who is trying to woo a much younger woman, played by Decker. Trying to cover up for a lie that he got caught in, Danny is forced to pretend that he’s in the process of divorcing his wife, who actually happens to be his assistant, played here by Jennifer Aniston. As the lie mushrooms into even more lies, Danny and his friends, and his potential new love, will head to Hawaii for a trip that will likely change everything. In this oddball animated comedy, James McAvoy and Emily Blunt voice the whimsical Gnomeo and Juliet, a love story between two garden gnomes separated by… the colour of their hats. In one yard, the blue-hatted gnomes frolic, and next door, the equally happy red-hatted gnomes have their fun, but when Gnomeo and Juliet fall in love, it causes strife that could keep the would-be lovers from being together. What’s there to really say about a big-screen Justin Bieber movie? You’re either a thirteen-year-old fan of the overexposed teen sensation, or you’re a parent of a thirteen-year-old fan and you’re being dragged to see said media sensation. While most people are probably completely tired of hearing about Bieber, just as some of us are just as tired of hearing about Lady Gaga, there’s no doubting that this is going to be a hot ticket this weekend. Who knows though, maybe you’ll want to check out the film to see how Bieber went from a YouTube sensation, to being one of the biggest artists in the world?